That is, happy birthday to the America that our forefathers founded. Happy birthday to the godly remnant of America as it was created - to be a place of freedom to worship the Almighty God of the Holy Bible, not for "freedom of religion" to worship any false god. 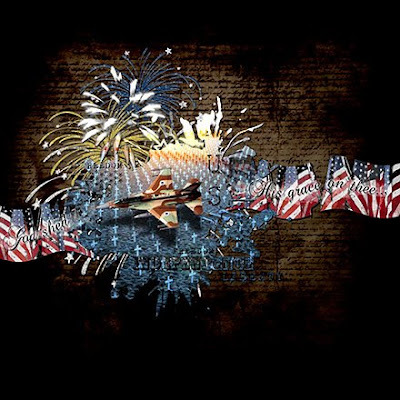 Happy birthday to the America that was born at great personal sacrifice to be a Holy Nation Under The One True Living God! Happy birthday to the America who's ordinary citizens have risen to become heroes sacrificing their lives generation after generation, not only for our freedom, but for the freedom of people all around this world, many of whom not only don't acknowledge this great sacrifice on our part, but actively hate us, slander us and harm us. Happy birthday to the America who has continually given more in financial and all other kinds of aid to strangers around this globe than any other in history, even when we don't have the money to do it, but create debt that our children and those after them will have to shoulder, often without any gratitude and far too often with acts of aggression toward us despite our irresponsible generosity. Happy birthday to the America who strove to be a light to the world by it's ideals of morality and justice for all. To the rest who call themselves Americans I pray you do some deep soul searching and that Our Heavenly Father convicts your hearts of the sin in them and grants you repentance to turn to Him and be saved. If enough people will do this, our nation will be saved! There is still hope. There is still time to save America if we will do this, if we will return to holy and righteous standing with Almighty God and serve Him once again! Judgment against this precious and unique country would be removed and we would once again prosper and evil would subside. Good would once again be called good and evil would be called evil - and be shunned instead of glorified! God's hand of grace and mercy is growing thin as America rushes ever deeper into sin and pushes Him out of this great nation that was founded solely to serve Him and has been so blessed by Him all these years. Awake America! Pray for our country and it's leaders and it's population that hearts return to our Maker in holy devotion! Awake America and realize there is no guarantee that America exists forever! Look at history! We are the longest surviving democratic republic in the history of the world and that only because of the divine protection of God Almighty. He is not compelled to protect those who reject him and refuse to live by His laws of righteousness. Let's be sure to keep all our military personnel in our prayers. Regardless of our personal stance on the war, they are there at great personal risk and sacrifice serving our country and they deserve our lifting them before the Father's throne regularly for protection and the salvation of their souls. And let's remember their families at home too! Thank you so much for this Freebie. 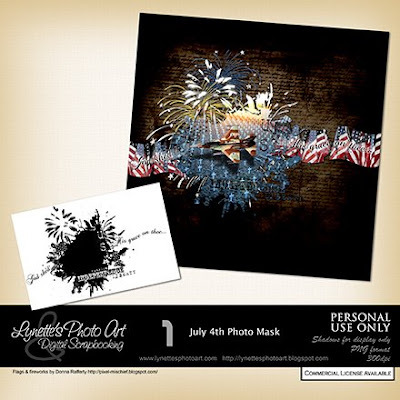 I want to let you know that I posted a link to your blog in Creative Busy Hands Scrapbook Freebies Search List, under the Fourth of July - Red, White, and Blue post on Jul. 04, 2009. Thanks again. Thanks, what an awsome mask. Your mask is absolutely amazing. I can't WAIT to use it. Thanks you so much for sharing it with us. It's awesome. This is beautiful, thank you! I also love the header on your blog, awesome!